When Rob Schouten Gallery at Greenbank Farm presents its second annual, “Art for Hearts & Hammers” benefit show from Friday, Feb 7 through Monday, March 3, the word “home” will be on everybody’s mind. More than 40 local artists will show their work; none are limited by theme. But, because this is the Hearts & Hammers show, “home” is an interesting theme that pops up. This annual benefit show reflects the community spirit that holds significance for the artists who are in it. Sales from the show will benefit South Whidbey Hearts & Hammers, a local, nonprofit community-service organization that repairs the homes of homeowners in need, and keeps our neighbors safe and warm in their houses. 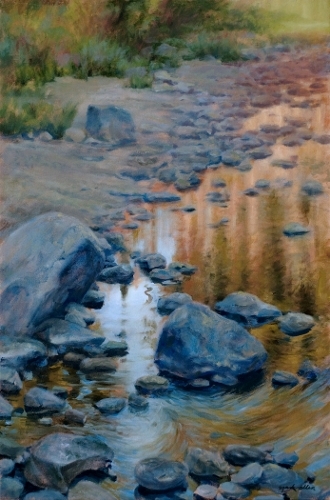 “I paint the feeling of place; these living mountains, forests, waters and towns. My home is Puget Sound. It starts at the doorstep,” painter Mark Skullerud said. Indeed, Skullerud paints his Puget Sound home with the heart of a true nature lover. Glass artists Robert Adamson and Janis Swalwell have called the the island home for more than 30 years and have been creating signature glass pieces for 44 years. The colorful glass pieces that are created by these two artists bring plenty of “artful heart” to the gallery. “Home is about refuge, sanctuary, family, retreat and heart,” Swalwell said. 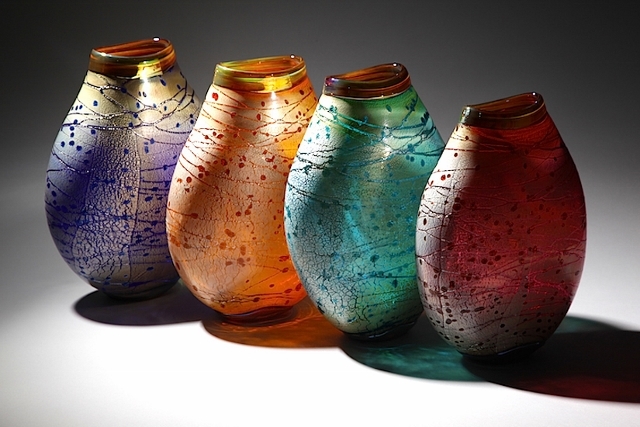 Handblown glass vases with silver overlay by Robert Adamson and Janis Swalwell. 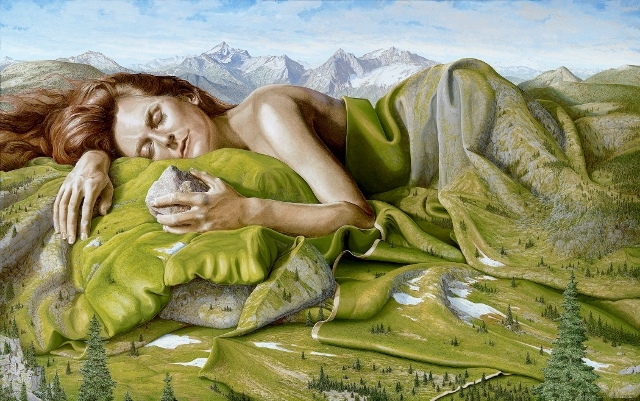 “Earth”, oil on canvas by Rob Schouten. Gather with us at Rob Schouten Gallery to see the art that will benefit this excellent organization, meet the artists and enjoy delicious refreshments at the opening night party of Art for Hearts & Hammers from 5 to 8 p.m. at First Friday at the Farm, Feb. 7. Participating this year are: Robert Adamson, Linnane Armstrong, Maryon Attwood, Morgan Bell, Anne Belov, Francy Blumhagen, Rebecca Collins, Buffy Cribbs, Angie Dixon, Richard Engstrom, Christine Nyburg Epstein, Richard Evans, Dan Freeman, Georgia Gerber, Katrina Hude, Randy Hudson, David Iles, Richard LaLonde, Bruce Launer, Robbie Lobell, Mark Lucero, Joe Menth, Bruce Morrow, Susanne Newbold, Anna Mastronardi Novak, Mary Ellen O’Connor, Kathleen Otley, Jim Patereau,Rob Schouten, Sharon Shoemaker, Mark Skullerud, Nancy Skullerud, Sharon Spencer, Janis Swalwell, Kim Tinuviel, Lloyd Whannell, Sandra Whiting, Cyndi Wolfe, Frances Wood, Angèle Woolery and Beth Wyatt. 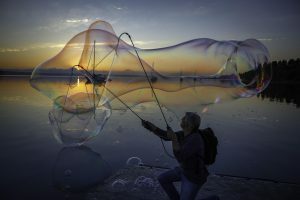 To keep this benefit show sustainable, we divide the sales equally three ways: one third to the artists, one third to the gallery and one third to South Whidbey Hearts and Hammers. For more information about South Whidbey Hearts & Hammers click here or call 360 221-6063. For more information about Arts for Hearts & Hammers, call Rob Schouten Gallery at 360.222.3070 or email info@robschoutengallery.com. The Rob Schouten Gallery, a premier showcase for Whidbey Island and Northwest artists, is located at historic Greenbank Farm on scenic Whidbey Island amidst rolling hills and forests offering breathtaking views of Puget Sound and the Olympic and Cascade mountains. Winter Hours are 10 to 5 on weekends, 11 to 4 weekdays, Tuesdays and Wednesdays by appointment only. 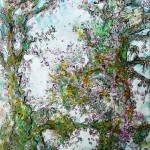 Pictured at top, “Home is Her Memory of Spring” encaustic painting by Anna Marstronardi Novak.